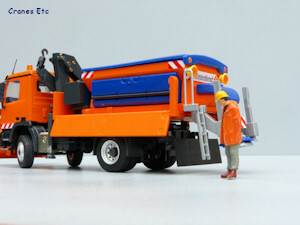 Tipper sides and access ladder can be lowered. Main parts removed and parked in the yard. Truck doubles as a general purpose vehicle. Tips to a good angle. 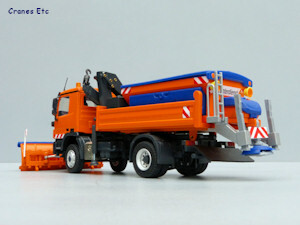 This model is a Mercedes Benz Actros 4x2 light tipper truck chassis, and it is fitted with a loading crane, snow plough and spreader for de-icing salt. 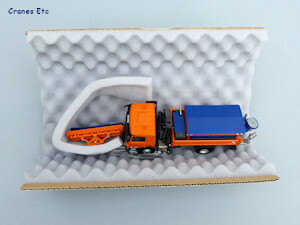 The model comes in a Conrad branded box with the model protected by a foam rubber insert. 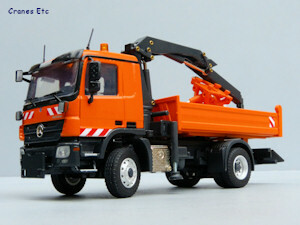 The review model was missing two extra headlights which fit to the front of the cab. These were quickly supplied separately. There is no information about the real machine or the model. 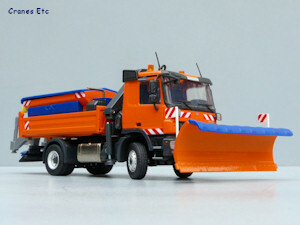 There are a number of parts to fit including the door mirrors, roof aerials, warning signs and snow plough. 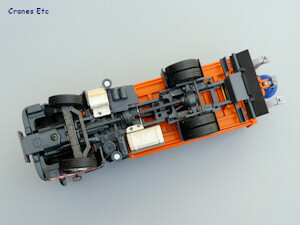 The chassis detailing is good with the suspension modelled in plastic, and the full transmission is modelled. The steering is represented in a functional way and the wheel hubs are smart with the same tyres fitted on all axles. The cab has aerials and beacon lights on the roof, and the lights at the front have plastic lenses. There are separate door handle inserts and the access steps are textured which is decent fine detail. Under the cab is an engine block. Inside the cab details are reasonable and the Mercedes logo on the steering wheel is a nice touch. Behind the cab there is a chromed fuel tank, the wheel arches are plastic, and at the rear the lights are painted. A soft flap covers the rear end. 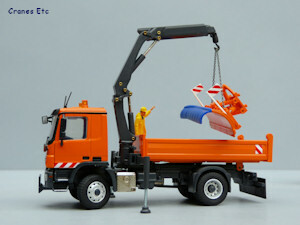 The loader crane has plastic stabiliser beams and a metal boom except for the two telescopic sections which are plastic as is the hook. The tipper body is metal with ribbed sides which have some warning graphics applied. 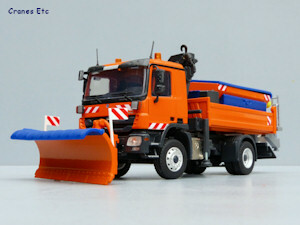 At the front the snow plough has a metal blade with anti-wear plates on the bottom edge, and a plastic top chute. Behind the blade the support structure is suitably complex and there are a couple of warning flags. The spreader equipment is quite heavy as it has a metal frame. There is a metal generator at the front which on the review model was the opposite way around to that shown in Conrad photos, but it is easily reversed if required. Inside the hopper there is a plastic screw to push material to the spreader and a plastic cover fits on top. 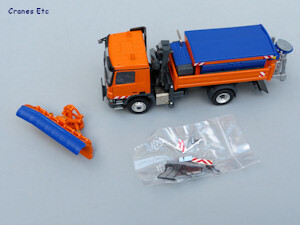 At the rear the spreader is a plastic part as are the support legs. The access ladder and handrail are metal. Large hazard lights and a warning sign complete the detail. The front axle has a very good range of steering movement and the rear axle has float to represent suspension. The cab tilts to a good angle. 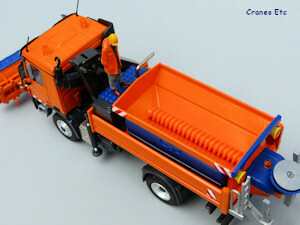 The stabiliser beams for the loader crane pull out and the pads can be lowered by unscrewing. 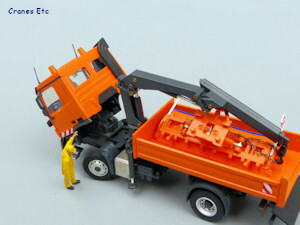 The crane unfolds, rotates and can be extended and posed in any position. The hook can be fixed in one of two positions. 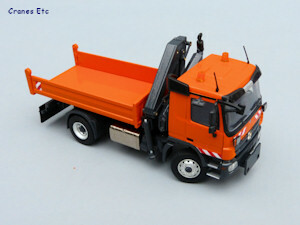 The tipper body tilts to a good angle. 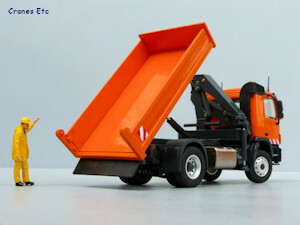 It also has sides which can be lowered with a very good range of movement. At the rear the black flap can be rotated. 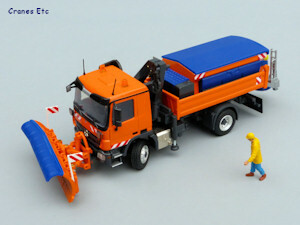 The snow plough can be attached to the front. It can be raised for transport or lowered for ploughing. It can also be angled to each side. 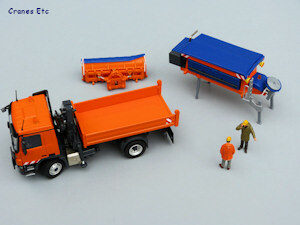 The spreader equipment can be supported on its own legs or fitted to the tipper. The cover can be removed to allow the salt to be loaded. At the rear the access ladder can be lowered. 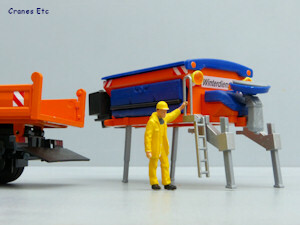 The spreader can be lowered from its transport and it can be oscillated from side to side to throw out salt which is a nice piece of model engineering. 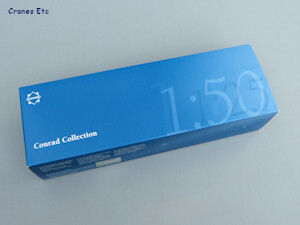 This is a typically well made Conrad model with a significant metal content and plastic used appropriately. The paint finish is good and the warning graphics add interest. The model is good value given the high level of functionality. In some respects this is a surprising model because of its very high feature count which allows it to be posed in many different ways. It is well made and looks very good. This version of the model appeared in early 2013. The spreading equipment removed from the tipper. Travelling with the blade in the back. The material screw inside the hopper.